Review: Sugar really did change the world! 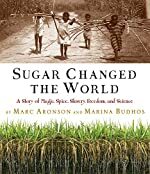 Sugar Changed the World is a non fiction novel written by Marc Aaronson and Marina Budhos. It is a true saga about how sugar affected the economy of various countries all over the world. Marc Aaronson and Marina Budhos are on a little quest to find out the "nature" of sugar. These two daredevils travel all over the world to find out the history and uses of sugar. You won't believe how many uses sugar has. It is truly amazing. You might just think of sugar as a sweetener, correct? However, sugar in the past and present has served many purposes. To my surprise I learned from my readings that sugar is used commonly in religious ceremonies. Also, I learned that thousands of people lost their lives just to gain power to grow sugar in countries like India. It is funny to say that such a sweet thing was not sweet after all. On the other hand, one good aspect was slaves got their freedom just because of the sugar boom. I thought that was amazing because one plant saved hundreds of people. Astonishingly this helped the economy and bettered many people's lives. Another interesting fact was that that a majority of the world's sugar comes from India. I was surprised because the first sugar cane plant grew in New Guinea. The Indians did not just plant the most sugar they kind of helped lead up to the word candy. Basically, kahanda in an ancient Indian language meant "piece of sugar". Then, it got passed through Persian then Arabic and finally, stopped in Europe and became candy. In addition, Indians used sugar as an antidote. I think this is funny because when you think sugar what pops up in your mind is unhealthy! Ironically, if you think about it we cant live with out sugar it falls in almost everything people nowadays consume. Sugar Changed the World is the most interesting non-fiction book I have ever read. Over all, I rate this books a four star (out of five stars). I rate it a four star because I learned much about the aspects of sugar as well as the interesting history behind it. However, I wasn't truly addicted to the book because it was not a thriller but more like a textbook. I recommend it for ages 11 and up because the vocabulary might be a little challenging and at times grueling to read. In the end, if you finish the book you will find interest in not just the sweet characteristic of sugar but its many purposeful uses around the world. We would like to thank Houghton Mifflin Harcourt for providing a copy of Sugar Changed the World: A Story of Magic, Spice, Slavery, Freedom, and Science for this review. Have you read Sugar Changed the World: A Story of Magic, Spice, Slavery, Freedom, and Science? How would you rate it? I'm not usually one for non-fiction, but your review made this book come alive! You say it wasn't a thriller, but in terms of a real-life scenario, it was one. The phrase "stranger than fiction" comes to mind here, and this seems like a book than even a fiction fan like myself could enjoy. Thanks for writing such a memorable review!